Gaighar, Udayapur –People have been facing problem due to the landslide occurred along Gaighat-Phoksingtar road of Gaighat - Diktel road section for the past one and half months. Transport service has been obstructed on the road section following the landslide. Mostly patients of north hilly areas have been hit hard to reach the hospital due to the closure of the road following the landslide. Landslide still continues to fall at Saune and Chhamling along Gaighat-Diktel road section. 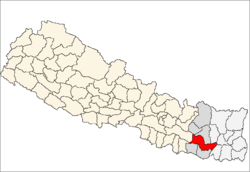 Raj Kumar Rai of Balamta said, "We took a pregnant woman to a hospital carrying her on our back. We were also compelled to take a patient to Gaighat for treatment carrying on the back, which took three days to reach there." As a result of the transportation halt, local people of hilly areas of the district are forced to walk two to three days to reach the district headquarters, Gaighat. When asked, Hari Pokharel, chief engineer for Gaighat-Diktel road office, Udayapur blamed a continuous landslide which has been aborting their efforts to clear the road. A dozer and an excavator used to remove debris have been stuck, he said.